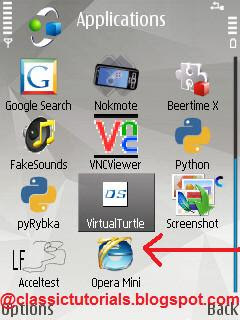 This tutorial is real fun and geeky..
What we will actually do here is we change the opera mini icon so that it looks nice when installed in our mobile. I shall use some free softwares also to make the icon and Winrar to edit the jar file. Select the appropriate model and save the jar file in your computer. Step 5: Right click and open with WinRar. 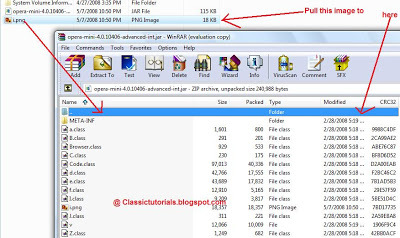 Step 6: Just select the new i.png image you created and pull and place it in winRar. It will ask you that you want to paste it or not. Select OK.
Thats it. Now send the jar to your mobile or install it from your pc to your mobile. Here is what you will get. Did you like that! Try some cool icons.. Let me know if you face any problem. It would be really nice if you give your comments.